In north western England close to Wales, a short way outside of Liverpool, sits a small city called Chester that holds some of the English history that is hard to find elsewhere. The history precedes even Medieval times all the way to the Romans. The Roman walls still stand and surround the city to this day. Within the ancient city walls lays Chester Cathedral which is a main attraction for numerous people that come through to see what Chester is all about. The cathedral that stands today has been around since 1540. The earth beneath it has always been a place of worship even during the Roman times approximately 40 to 410 AD. That of course was when the city was known as another as Dewa. A Saxon saint called St. Werburgh was dedicated in a church during the 900’s that once stood where the cathedral currently stands. The church was unfortunately destroyed during the 1000’s and an abbey replaced the church. The sacred house became uninhabited in the 1530’s and in 1541 it became an official cathedral of the Church of England. With this church having such a dated age, the architecture goes back to 1300’s. With many additions and restorations over hundreds of years there are a variety of styles that include Norman and Gothic. As grand and large as the cathedral is, it is made up mostly of sandstone. A soaring tower, arches, turrets and more than enough of beautiful stained glass windows to show off the beauty and majesty that it holds. Gargoyles sit about on the walls and detailed engravings of busts and angels adorn the cathedral. Even from outside the opulence and art cannot be overlooked. The stained glass windows show the array and assortment of colors that the light shines on. Many of the scenes are of Biblical nature and are the newest addition to cathedral being added in the 1800’s and 1900’s. Although, the most recent stain glass depiction was added later commemorating English soldiers of World War I. The church itself is a piece of artwork, but inside is even more breathtaking. With carvings, statues, wall paintings and tile on the floor all of these minuscule details present to all who enter the masterpiece that is Chester Cathedral and no wonder people flock to see its’ glory. Entering the cathedral is no cost, though the staff would recommend a small donation per person. The tour is self guided and a way to delve deeper into the displays and spectacles that surround the people that look upon it. The famous tower is now accessible to the public. A tour guide will take people up to 125 feet to a beautiful look upon the surrounding sites. The guide will tell tales, history of the cathedral and nearly a thousand years of history summed up of course. The walk up is worth the look to the landscape of the countryside. Inside the gardens, there are kept owls and falcons which is an interactive falconry expedition. The staff will showcase the various birds and show the birds expert skills in hunting and flying. In addition, there are a few small trails to take children on walks through the garden areas. Another ambitious project is building the cathedral into LEGO’s! Literally, brick by brick the recreation of the cathedral is coming alive, just in much smaller form. Each part of the cathedral is being brought to scale including the organ and the tower. Anyone can build by donating 1 Pound to the Chester Cathedral Educational Trust Fund. Originally a 13th Century monk’s dining hall; this now refurbished cafe hosts a quick and quaint spot for everyone to get a bite to eat, afternoon snack or just take a moment to relax. At the end of the tour, do not forget to stop into the gift shop for a different type of souvenir to remember a special place and time. Even though the cathedral is a hot spot for tourism, this ancient cathedral still is a fully functional church. With sermons, worship, mass and a host of other services, anyone and everyone is welcome to be a part of how and why this cathedral has remained a place for people to flock to and pay homage. 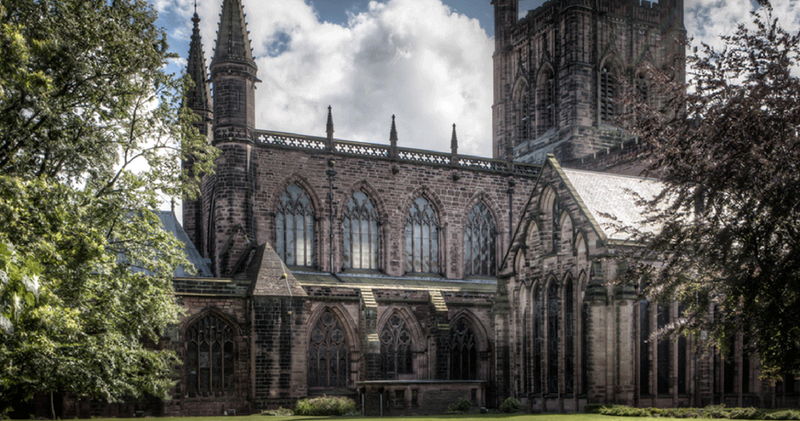 Before or after visiting the Chester Cathedral there is still plenty to do and see in Chester. Even though the cathedral is the most famous and most visited, Besston and Peckforton Castles are a way to look more into the English past. Since it was a Roman city first, there are plenty of Roman remnants such as the Chester Roman Amphitheater and in Grosvenor Museum there are Roman artefacts for people to see. Even walking through Chester Rows is like stepping back in time to see the Roman streets and the buildings that date back far as the 13th Century. Chester has been voted as one of the most romantic cities in the world. With nearly 2000 years of history, stories and legends there is no wonder why. A trip to Chester to not see just the city but one of the most splendorous cathedrals in the whole world is worth the trip. If you are driving yourself, the nearest public parking in Chester is Gorse Stacks and Princess St.
Travelling with the Hop on Hop off bus around Chester has a stop at the Cathedral. Arriving at Chester Station, you have a choice of Chester Taxis located at the taxi rank outside the station or use the bus service running every 10 minutes into the city centre.